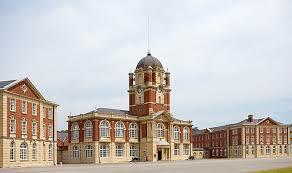 Hugh Montgomerie has kindly suggested that we organise a tour of the Royal Military Academy Sandhurst. We hope to go on WEDNESDAY 29th AUGUST and will have a coach if there are sufficient numbers. The tour costs £15, takes three hours and involves walking about half a mile.Our plan is to pre-book a light lunch in their cafe costing £5 a head. We have suggested arriving at 10.30, having coffee, then the tour followed by lunch. We would leave around 2.30. A tour of the grounds would be included provided we go by coach.We need to know numbers in order to get quotes for a coach. RMA Sandhurst also need to know the size of the group in case more than one guide is needed. They also require full payment at least two weeks beforehand.We realise that August seems a long way off but please register your interest as soon as possible if you think you may join us. You will not be committed at this stage.For further details or to register interest speak to Liz Davies, email mandedavies@gmail.com or phone 01932-225584.